This May marks the first anniversary of the Anime Holocaust. A minute of silence for all the lives lost in this war. Fortunately despite the threats, the anime community remains strong and focus against the tyrant. Say NO to immoral business ethics! DOWN TO INSIDIOUS AND DICTATORIAL COMPANIES! Lol Anime Holocaust. Good one. 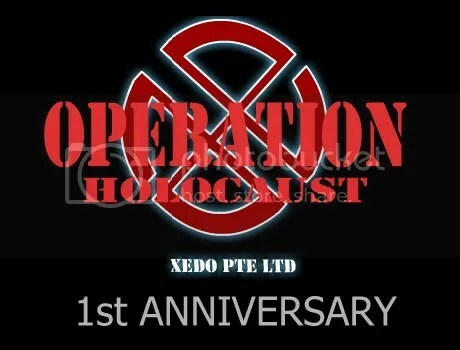 Haha.. Xedo:0, Anime community:100.. Should I blog about the holocaust aniversary too? write their names in the black note book we shall! anyway nice new avatar. yes you should. spread the message. the power of the community will not be taken lightly. We will stand strong against the tyrannous acts! Down with Xedo! FOR THE FATHERLAND AND THE GLORIOUS STRUGGLE. I PRESENT THIS IRON CROSS. yoz… help me wipe of the dust in the forums and my blog sometimes can? glad to have both your support, comrades from across the causeway. united we will be against this common enemy. yes indeed. time do files. but some people still live in fear. please come back to the forum next Monday. Nagisa will be recruiting members for the drama club. more details next week. @gordon: sorry i took such a long time. Did OT almost everyday last month coz its their peak period. And to all who lost their lives in this disastrous and costly war, know that today, your legacy lives on. Haven’t bought anything from them, ever, and frickin’ proud of it!